Applied is a CM certified Level 2 entertainment service facility and North American certified warranty center. 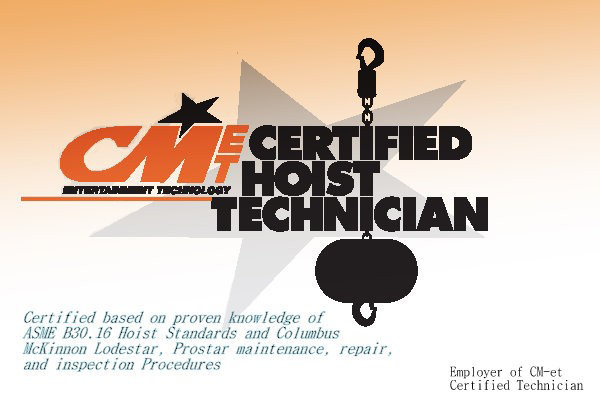 We are proud to be able to offer CM certified level 2 service and support for CM chain motor repairs and inspection needs. Applied offers multiple levels of service depending on needs including; over the phone support, expedited parts shipment, in shop repair and maintenance and periodic inspections. As regulations and requirements get more demanding, rely on Applied to keep your motors up to industry standards. We have the certification, equipment, certified parts on hand and skills necessary to perform diagnostic and repair procedures on CM chain motors. When you purchase CM chain motors, Applied will include carry handles, a heavy-duty chain bag, a cable pick ring and a FREE first year inspection. Additional chain motor services offered by Applied include; complete cleaning, repainting, weatherproofing, capacity conversions and wiring conversions. If you require any of these or other chain motor services, please call our electronics team.